An ugly duckling moment – For the fainthearted . . .
A family member’s appointment at an optician’s in Wells meant half an hour to wander the streets of England’s smallest city. Being England’s smallest city means that a circuit of the streets does not take very long, so the path around the moat of the medieval bishop’s palace was added to the walk. The moat is famous for its swans, which, each afternoon, pull a string to ring a bell at a window of the gatehouse in order to solicit food. The swans seem plentiful this year, a cluster of cygnets swam along the moat behind two adult birds. Accustomed to the throngs of tourists who crowd the environs of the cathedral and the palace in the summer months, they were oblivious to a solitary passer-by; oblivious and determined not to be photographed, they seemed to spend their entire time with their heads tucked down. Walking back toward the entrance of the grounds, there was a sudden sound of flapping wings. Turning, with phone in hand, there was an opportunity to capture a cygnet as it left the water, perfectly reflected in the surface of the moat. It seemed almost a statement that patience would give a chance of a picture far better than one of a group of cygnets paddling. 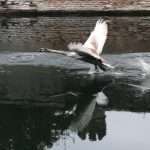 The mottled brown and white plumage of the cygnet belied the grace the bird possessed as it took to the air as a swan. “There was once an ugly duckling, with feathers all stubby and brown,” the words from the song of childhood days ran through the mind while walking back into the city square. Inspired by Hans Christian Andersen’s children’s story, the song was an encouragement to those of us who were plain and dull. Of course, the cygnet in the song is unaware of its nascent beauty, it hides itself away all through the winter months because it believes itself to be ugly. 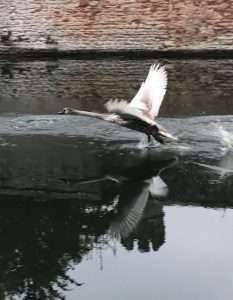 The cygnet on the moat was under no such illusion, prior to taking to the air it had been preening itself in the company of its siblings, there was no question of being hidden in the rushes. The natural world is devoid of the sensibilities that shape human behaviour, it has no sense of any need to pretend things are other than what they are. The cygnet was born a swan and will remain a swan, similarly, the ugly ducklings among us tend to remain so.